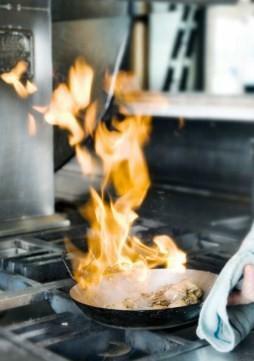 Have you ever wondered, "What is flambé?" Simply put, flambé is a cooking technique that utilizes alcohol to create a fire within the cooking pot. The fire stops when all the alcohol is burned off. What Is Flambé and How Do You Flambé Something? Adding alcohol to a dish and lighting on fire is done for both dramatic effect and to enhance the flavor of the liquor within the dish. It goes without saying that this technique can be dangerous and you should never attempt to move a pan while the liquor inside is on fire. First select an appropriate liquor or liqueur. The liquor (or liqueur) should be a brandy or 80-proof. Anything with a higher proof is very volatile and simply put too flammable. It's generally suggested that you choose something that compliments what you are cooking. Heat the liquor either in a pan or in the microwave until just below the boiling point (175 degrees Farenheit). Make sure that whatever you are cooking is also hot. If the alcohol doesn't light, it is probably because this step wasn't done properly and something is too cold. Add the liquor carefully to the flambé pan. Flambé pans have long handles and are deeper than sauté pans. Using a long match (like a match for a fireplace) or a kitchen lighter, light the fumes around the pan (as opposed to the liquor inside the pan). Let the dish cook until all of the alcohol is burned off. Serve immediately as soon as the dish stops flaming. Technically, you can flambé anything you think could use the extra flare. However, there are a few traditional dishes that are typically flambéed. Bananas Foster is a dish that combines sugar, cream, bananas of course, and rum. Cherries Jubilee is a dessert that is typically prepared with Kirschwasser and then is served as a sauce over vanilla ice cream. While fruited brandies or sweet liqueurs are generally used to flambé fruits, cognac or whiskey is generally used to flambé meats. Be prepared for a sudden ignition of flames and avert your face accordingly. Stand back and always use a long kitchen match or a long kitchen lighter. Light the fumes and never the alcohol directly. Do this by lighting the side of the flambé pan rather than the center and of course, never directly touch the alcohol. Do not add too much alcohol. Never pour alcohol into your flambé pan when the pan is over an open flame. The flames can light the fumes and consequently cause an explosion. Use normal kitchen safety precautions and wear clothing that is fitted rather than lose lest sleeves or a tie get caught in the fire. If you want to flambé without the alcohol, soak sugar cubes in extract and use that in lieu of alcohol.